What does it mean when the Bible says that Adam was made “in the image” and “after the likeness” of God (Gen 1:26 King James Version)? And how does this relate, if at all, to the Nation of Islam Lesson (Student Enrollment No. 1) which states that the Original Black Man is “God of the Universe?” Few writers have discussed these two scriptural statements in the same context. This Biblical interpretation or exegesis by Min Farrakhan may seem shocking at first: personally I have never come across a Jewish or Christian reader who explicitly reads Gen. 1:26 as suggesting that the Black Man is God. They rather interpret it to mean that mankind in general shares a likeness with God only in his soul. Is Min. Farrakhan misreading the text or imposing on it a “Black Muslim” reading that is inappropriate for the Biblical context? Absolutely not. It is the common Jewish and Christian exegesis that fails to take well enough account of the original context of the Biblical verse. This is why God forbade Israel from bowing down before images made by man (Exodus 20:1-7). God has only one legitimate image which He made Himself: Adam. But there is more. Like the related Akkadian term tsalmu the Hebrew term tselem has a dual significance: it can mean both “statue” as well as “black” for, as prominent Torah scholar Dr. Avivah Zornberg informs us, the concept of blackness is “at the root” of the word tselem. Adam as tselem is therefore the black body (statue) of God on Earth. The Torah’s declaration that Adam is the black body of God in which God’s essence resided and that he is therefore God Himself on earth is not different from Min. Farrakhan’s suggestion that Gen. 1:26 indicates that the original Black Man is God. 28. And when your Lord said to the angels, ‘See I am creating a man of dry ringing clay, of black mud wrought into shape. Adam is made from materials used to make a statue: ṣalṣāl, “dried clay that produces a sound like pottery” and ḥamaʾ, “fermented black mud.” That this black material has significance for the color of Adam himself is clear: the very name Adam, according to Arabic linguistic scholars, derives from the Arabic word ādam which means dark skinned. According to some Islamic commentaries, this initial black body (Adam) remained inert and hollow like a statue for forty days until God blew His Spirit into it. Adam became alive and God then ordered the angels to worship this Black original man. Sajada is what Muslims do when worshipping God, and this worship is reserved for God alone: “And to Allah makes prostration (yasjudu) every living creature that is in the heavens and the earth, and the angels too (Surah 16, Verse 49).” Yet it is precisely these angels who are ordered by God to offer this worship to Adam, the original Black Man, after he had been enlivened by God’s own Spirit. This worship of Adam by the angels has been a difficult problem for Qur’anic commentators past and present, but it is perfectly consistent with God’s other Revelation, the Torah. Read in this context, the Qur’an is restating what Genesis already stated: Adam, the original Black Man, is the body (statue) of God in whom God’s Spirit resided on earth and is therefore the medium of divine presence on the earth and the legitimate recipient of the worship that is reserved for God. How did Farrakhan get it so right and other readers of the Bible get it so wrong? What does he know that centuries of Jewish and Christian readers did not? The more appropriate question is: whom does he know? The answer: he knows the source of Supreme Wisdom. The Honorable Minister Louis Farrakhan’s nearness to the Fount of Divine Revelation puts him in a privileged position as it relates to understanding scripture. 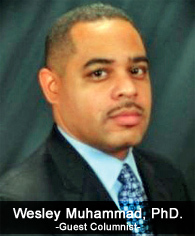 Dr. Wesley can be reached at drwesleymuhammad @ gmail.com. His sources for this article include Andreas Schüle, “Made in the >Image of God<: The Concepts of Divine Images in Gen 1-3,” ZAW 117 (2005): 1-20; Hans Wildberger, “Das Abbild Gottes, Gen 1:26-30,” ThZ 21 (1965): 481-501.